Sustainable energy is the future for America’s power needs, and Black Hawk College is leading the way in sustainable energy technology. In May 2010, the conventional fossil fuel-powered 500-watt lights that illuminated the sign on the Moline 70th Street entrance were disconnected and replaced with renewable energy-powered LED lights. These six, 14-watt floodlights use a total of 84 watts of electricity, just 1/6th of the power they used to consume. 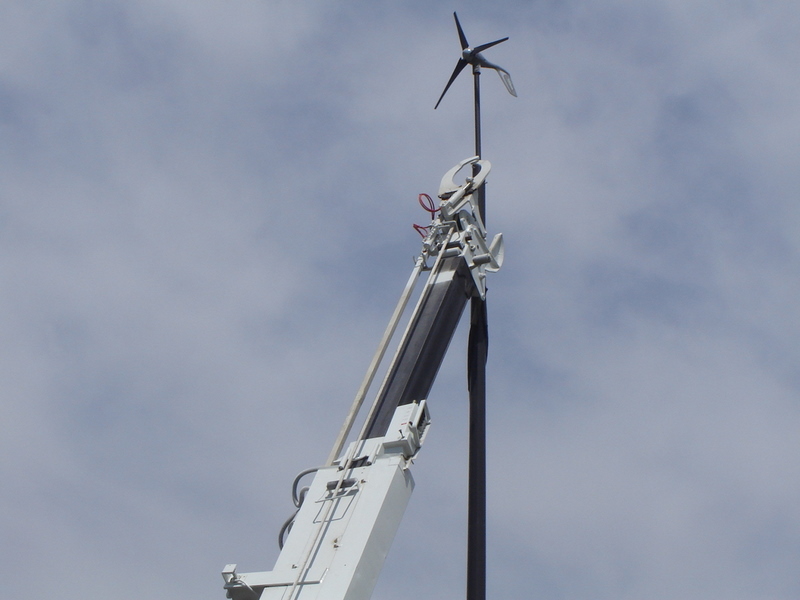 The sign lighting is now powered by clean, renewable energy generated from two solar panels and a micro-wind turbine. The solar panels and wind turbine will alternate charging the battery bank that powers the light at night, depending upon weather conditions. This project was supported by a grant from the National Science Foundation. It and similar projects will be used to educate not only Black Hawk College students, but middle and high school students from around the Quad Cities. 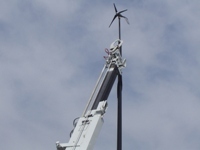 On the BHC campus, the micro-wind turbine and solar panels will be used for research and development in the college’s Sustainable Energy Program. View more pictures. Sustainable energy comes from sources like sun and the wind, is available every day and cannot be used up. Non-renewable energy sources, or fossil fuels, were made over millions of years by the buildup of plants and animals, sand and mud, and will one day run out. Fossil fuels used every day are coal, oil and natural gas. Fossil fuels pollute. They produce gasses like carbon dioxide (CO2) that trap heat and cause global warming. Not only is sustainable energy a source that will never deplete, it is also non-polluting. All forms of sustainable energy discussed here produce energy without emitting harmful pollutants. This makes solar, wind, geothermal, and biomass-produced energy a good idea for our country’s future and a growing source of jobs as the sustainable energy industry grows. With its focus on renewable/sustainable energy and a commitment to giving students the skills they need for tomorrow’s technology, BHC offers a Sustainable Energy certificate. This 50-credit hour program can be completed in four semesters and includes AutoCAD, DC circuits, hydraulics/pneumatics, mechatronics, logic systems and sustainable energy systems, among other courses. For program details, click here. 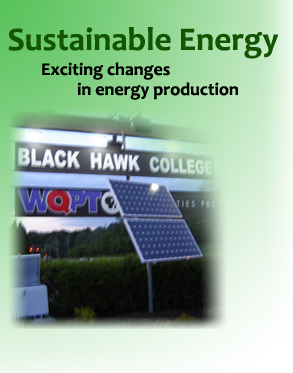 Learn more about solar and wind energy at Black Hawk College.